Washington (CNN) – White House National Security Adviser Susan Rice told LGBT activists on Tuesday that protecting and upholding human rights for all is "fundamental to our American character" and "essential to our American story." She said President Barack Obama is committed to protecting the rights of gay and transgender couples, comparing their fight for equal rights to the struggle African Americans faced during the civil rights movement. 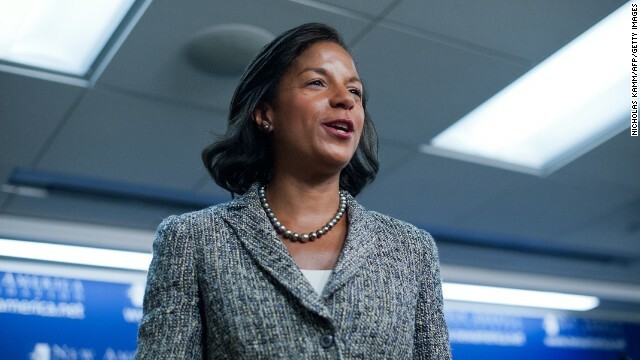 Rice, speaking to activists in Washington, said she would not be in the position she is today if her forefathers had not fought on her behalf. "I feel a responsibility and a personal passion to help others enjoy the same opportunities that I have been blessed to receive,” she said. Rice delivered the keynote address at the White House Forum on Global Lesbian, Gay, Bisexual and Transgender Human Rights. “When you share quiet moments with your friends and families, your church members and coworkers, you seed mutual understanding,” Rice added. “When a pro-basketball player, or an NFL draft pick, or a high school principal comes out-when a transgender woman is on the cover of TIME magazine-young people all over the country see that they can live their lives openly, with dignity, and achieve great things. " She said that in many places around the world simply being gay or transgender is enough to make someone the victim of slurs or violence, adding that in many places just being a supporter of the LGBT community was enough to make someone a target. "There are almost 80 countries, eight zero, countries in this world where discrimination against LGBT citizens is enshrined in law, and that number threatens to grow,” she said. She then turned her attention inwards to the United States, noting that domestically, "prejudice has deep roots, " and laws limiting gay rights are still on the books in many states. Rice ticked off some of the efforts the Obama administration has taken to help foster rights for the LGBT community, and said pointing the repeal of the "don't ask, don't tell" policy, bringing an end of the ban on openly gay men and women serving in the armed forces. She also said law enforcement officials now have the tools to prosecute crimes against the LGBT community as hate crimes. She urged attendees to keep rallying around the cause and said that the more open people are about their sexuality the more, "Young people all over the country see they can live their lives openly." She told attendees that, "With more voices to enrich and amplify the message – the message that gay rights are straight up human rights - we can open many more minds. " Rice said that while change takes time everyone should look at the things that have been accomplished like legalizing gay marriage. "In 19 states and the District of Columbia, marriage equality is the law of the land. And, last week, the Presbyterian Church overwhelmingly voted to allow their ministers to officiate these ceremonies. " Rice said. According to the White House, attendees at the conference included members of the faith community, LGBT activists from around the world, HIV and health advocates and members of the human rights community. Sip That Kool Aid, It's All You're Good For. Next time it's a straight republican ticket. I've decided to make sure every human living within the United States, is going to relinquish a job, a home, education, or be sent off to fight a trumped up war. I'm tired of hearing their gripes and complaints. It's time to make sure everyone suffers equally. Vote republican. Any decent and authentic "conservative" would agree that it's not the place of the government to tell consenting adults who to love or who to "marry" and that such self-determination is indeed a legitimate human right. I am a follower Christ. God bless you all. Just – How can you be so wrong day on and day out? how can you come in here every day and lie? you know what i say is the truth. i guess it was just a coincidence obama had his great revelation a few months before an election. just like the coincidence of two years of missing emails. obama is bought and paid for and you can't bring yourself to admit it. Why anyone would believe a word Susan Rice has to say is BEYOND me. Thanks Suzie...now go away. You've already shown yourself to be highly irrelevant. No problem. Guns Over People teatard OVERREACH continues to fail state by state. Susan Rice just parrots what her handlers tell her to.